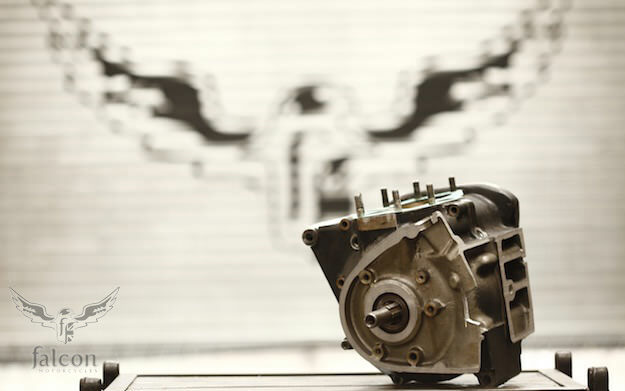 Anticipation is building fast around the new custom motorcycle from L.A.-based Falcon. The Kestrel is the long-awaited follow-up to the 2008 Bullet, which was the surprise hit of the Legend of the Motorcycle show and effectively launched the Falcon brand. This new machine is the second in Falcon’s “Concept 10” series—a carefully planned run of re-engineered bikes, all with iconic British engines. 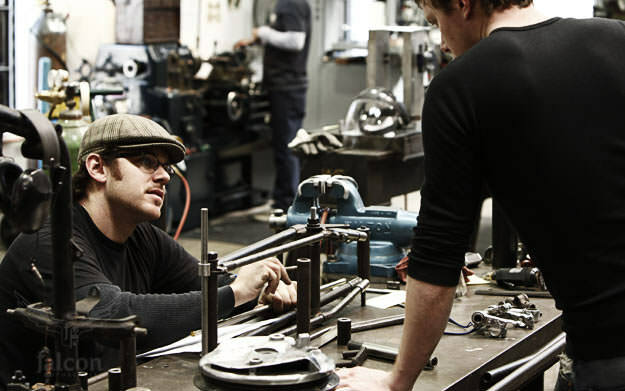 The Kestrel will be unveiled at the Quail Motorcycle Gathering this weekend in Carmel, but the image above gives you an exclusive close-up peek at the detailing—showing the level of craftsmanship that Falcon builder Ian Barry (below, left) is famous for. Over 2,000 hours of artful machining, stretching, hammering, rolling and hand-carving have gone into the Kestrel, Barry’s final bow to a decade of building custom Triumph twins. The core of the engine is from a 1970 ‘unit’ Triumph Bonneville; the gearbox was damaged, so Barry cut it off. The engine was then carefully reshaped with new contours. Barry made a jig for the engine case, allowing him to mount and aluminium-weld together the various pieces of his new design. 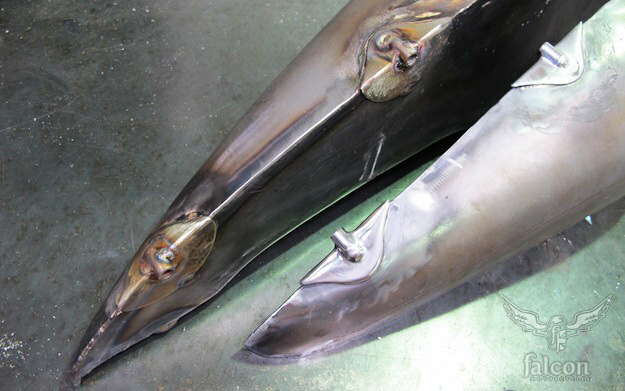 Cylinder machining was carried out in-house, using a 5-axis CNC machine and 7000-series aircraft grade aluminum. 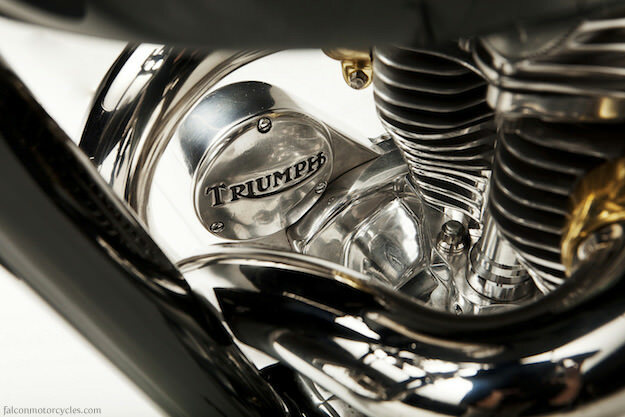 Round fins at the bottom are tapered to match the original Triumph diamond-shaped heads. Apart from ten inches of the original headstock and downtube, the frame is new. 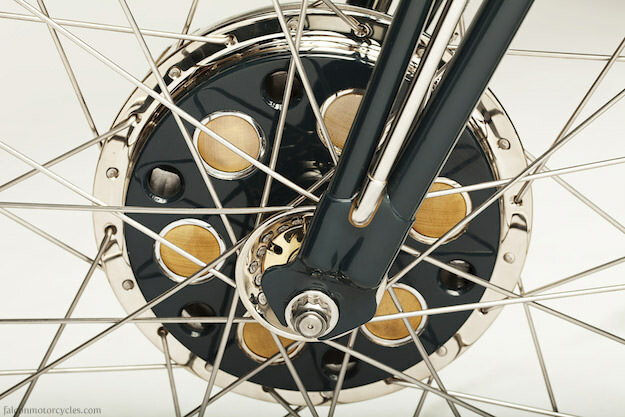 The girder forks are also custom-made—apart from a few of the original castings—and matched to a heavily modified and reshaped Triumph hub. The Kestrel’s aluminum oil tank was shaped with a wood mold, mirroring the curve of the back wheel. The gas tank (below) was made from several sheets of metal, but a four-inch round circle was ‘saved’ from the badly rusted original Triumph tank—it’s incorporated into the new design, allowing the soul of the original tank to keep going. The third in the Falcon Concept 10 series will be called the Black Falcon. It’s already under construction, and features a 1951 Vincent Black Shadow engine drenched in California racing history. Next in line will be a 1967 Velocette Thruxton, built around one of only seven ‘Squish Head’ engines made by Veloce—an engine that led from start to finish in the 60th anniversary Diamond Jubilee Isle of Man Production TT race. After that will come Falcon versions of a 1936 Ariel Square Four with overhead cams, a BSA, a Rudge, a Norton, and a Brough Superior. It’s a roll-call of the most iconic British iron, and the perfect raw material for Ian Barry’s unique vision. Bring it on.